Military, union and local dignitaries gathered Dec. 12 to celebrate the graduation and accomplishments of the second SMART Heroes class at the Western Washington Sheet Metal Local No. 66 training center in DuPont, Washington. 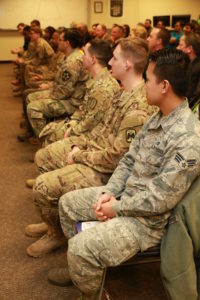 The class consisted of 15 soon-to-be or recent veterans stationed at Joint Base Lewis McChord. The seven-week class packs in 224 hours of training, equivalent to a first-year apprenticeship, and allows veterans — upon honorable discharge — to enter any participating training center across the country as a second-year apprentice. The first SMART Heroes class graduated on Oct. 3, and there are plans for up to six classes in 2018. Graduates ranged in experience from three to 13 years in the military from a variety of ranks. They include Army Spc. Marcus Renzelmann, Cpl. Ryan Curtis, Spc. Jeremy Coleman, Spc. Joseph Pineiro, Spc. Jesus Pruna, Spc. Edgar Moya, Spc. Jared Bushaw, Spc. Austin Ketcherside, Spc. Alex Evenson, Sgt. Rasheem Hargett and Sgt. Kweri Mena along with Air Force Senior Airman Suewa Vang and recent veterans Maya Fields, Justin Boyle and Kevin Moore. DuPont Mayor Mike Courts, an Army veteran, noted the city of DuPont will have $1.5 to $2 billion in development in the next decade and there aren’t enough skilled labor workers to complete the projects. The skills they gained during the class will help them progress in the trade, but the future possibilities for learning and advancement are endless, said Mike Harris, program director for the ITI. For many military members, transitioning into civilian life can not only be scary, but can lead to a gap in pay, loss of benefits and an insecure and uncertain future. Many don’t know how to either transition the skills they learned in the military to the civilian world or how to find not just a job, but a new career. The SMART Heroes program provides the guidance while recruiting new members to the trade with desirable traits such as a strong work ethic, sense of motivation and discipline. 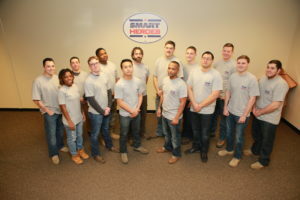 Not only is the SMART Heroes program helping the unionized sheet metal trade, it’s helping to lessen the unemployment rate of veterans in the United States. Upon entrance as a second-year apprentice, local contractors will hire graduates and provide on-the-job training necessary to complete the apprenticeship. According to the Bureau of Labor Statistics’ Employment Situation of Veterans — 2016, 20.9 million men and women were veterans — about 9 percent of the adult civilian population — and 3.9 million of those were Gulf War era II veterans, or those who had served since September 2001. For those era II veterans ages 24 to 34 — or those most likely to enter a skilled trade — the unemployment rate is 6.6 percent, nearly 2 percent higher than for civilians of the same age.